Attention Cat Lovers! This Is Weekend Cat Blogging #32! Every photo you post is a little lollipop of hope and sweetness. Keep it up, and your creativity and appreciation of life will lead you back to light and yourself. Hope that's not too metaphysical. We're walking there with you, Susan. Keep up the beautiful work. Thank you. Patchy Cat is such a legend Merow! Oh. My. Goodness.....This photo took me right back to a moment in my childhood when we thought we lost my kitty "Whiskers". Patchy Cat is doing her daily work out she is going to join Cirque Soleil and show her her acrobatic act! On top of the world...where all cats see themselves. you are so lucky to be surrounded by so many four-legged friends. did i mention that i think i might be in love with dan the donkey? sigh. What a fabulous photos of patches! How on earth did you get him to pose like that?! 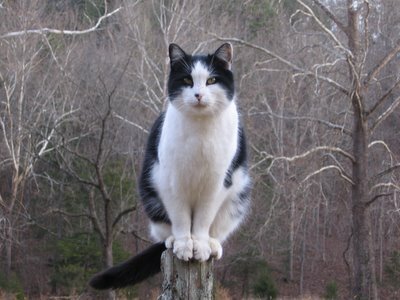 Patchy Cat is a wise-looking cat and he's gorgeously posing!